WACO, Texas – The No. 17-ranked Bears topped Oklahoma 7-3 Saturday afternoon at Baylor Ballpark thanks in part to trio of home runs and a stellar start by left-hander pitcher Paul Dickens. The southpaw Dickens threw 5.1 scoreless innings, recording nine strikeouts and scattering just two hits. It was his third start this season with at least nine punchouts. Offensively, Baylor smacked three home runs, its ninth multi-home run game of the season and sixth game of 2019 with at least three homers. Five Bears tallied multi-hit games to power the 13-hit attack. Baylor (23-10, 7-3 Big 12) wasted no time in getting to OU starter Nathan Wiles, scoring five runs on five hits in the first inning, including two home runs. Davis Wendzel blasted his fifth homer of the season, a two-run shot that scored Richard Cunningham, and Cole Haring destroyed the first pitch he saw for a three-run bomb that drove in Andy Thomas and Shea Langeliers. It was Haring’s seventh home run of the season, good for the team lead. As Dickens continued to deal, the score remained 5-0 until the bottom of the fifth inning. That’s when Langeliers pushed the Bears’ lead to 6-0 with a solo shot to the opposite field. It was his third home run of the season and second in as many games. Baylor would add another run in the sixth as Wendzel doubled in Cunningham to increase the lead to 7-0. The Sooners (25-11, 6-5 Big 12) got a couple of runs back in the top of the seventh as Cade Cavalli hit a solo home run off BU reliever Jacob Ashkinos, the first of three OU runs in the inning. A single and a pair of walks would chase Ashkinos from the mound and bring on Ryan Leckich in relief, who avoided the big inning by inducing a fielder’s choice groundout and a lineout. Baylor closer Kyle Hill came on in the ninth for a save situation. He got an Oklahoma pinch-hitter to bounce into a game-ending 6-4-3 double play and picked up his fifth save of the year. Dickens earned the win and improved to 4-1 while OU’s Wiles fell to 5-2 with the loss. The rubber game of the three-game set with the Sooners is scheduled for Sunday, April 14 at 3 p.m.
*Baylor earned its 50th win all-time against Oklahoma. It’s the Bears’ fifth victory over the Sooners under fourth-year head coach Steve Rodriguez. *Baylor outhit its opponent for the 27th time this season and sixth consecutive time. The Bears have outhit their opponent in each of their 23 victories in 2019. *The Bears tallied double-digit hits for the 20th time this season and fourth time in their last five games. *113 of Baylor’s 235 total runs in 2019 have come with two outs. *Baylor has hit 172 home runs in 200 games under Rodriguez. BU hit 54 homers in 2018, its most in a season under Rodriguez. The Bears are coming off back-to-back seasons with at least 50 home runs (51 in 2017, 54 in 2018) for the first time since 2009 (73) and 2010 (57). *Baylor has hit 34 home runs in 33 games this year. *Baylor has nine multi-home run games in 2019. The Bears had 15 multi-home run games in 2018, the most in a single season under Rodriguez (nine in 2016, 14 in 2017, 15 in 2018). *This is the sixth time Baylor has hit at least three home runs in a game this season. *Cole Haring hit his seventh home run of the season, matching his 2018 season total. *Davis Wendzel crushed his fifth home run of the season. He hit eight homers in both the 2017 and 2018 seasons. *This is the second time this season that Haring and Wendzel have homered in the same game. 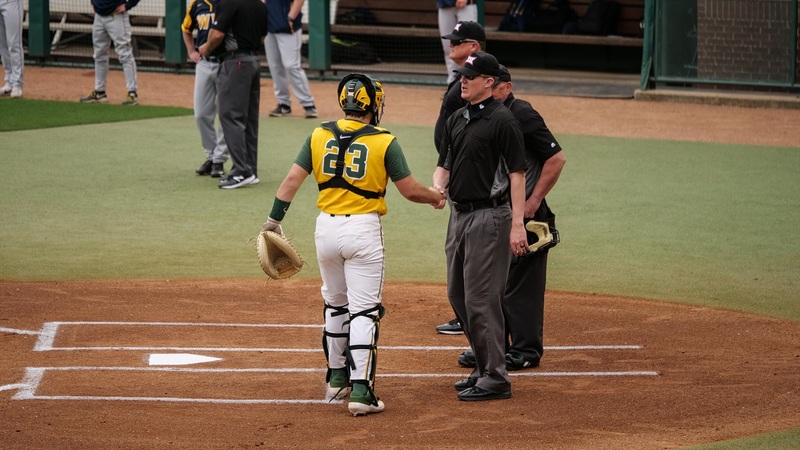 Either Haring or Wendzel have homered in eight of Baylor’s nine multi-HR games in 2019. *Shea Langeliers hit his third home run of the season and second in as many games. *Paul Dickens made his third start of 2019 with at least nine strikeouts. He earned his fourth win of the season, going 5.1 scoreless innings and allowing just two hits. *Dickens has recorded at least four punchouts in all of his seven starts this year, and at least five in each of his last six starts. *Ryan Leckich made his team-leading 18th appearance of the season. It was his 13th scoreless outing of the season. *Kyle Hill made his 17th appearance of the year and earned his fifth save. *Jacob Ashkinos made his 14th appearance of the season. *Nick Loftin extended his season-long on-base streak to 20 games. *Davis Wendzel has a 14-game on-base streak and a five-game hitting streak. *Cole Haring has a seven-game on-base streak and a five-game hitting streak. He has recorded back-to-back multi-hit games. *Richard Cunningham has a five-game hitting streak. *Andy Thomas has a five-game hitting streak. *Five Bears had a multi-hit game, as Wendzel, Langeliers, Haring, Cunningham and Josh Bissonette each picked up two hits. *Junior Hunter Seay made his first start of the season, batting eighth and playing left field. 3 – The Bears hit three home runs to power the offense in today’s 7-3 win. Additionally, Davis Wendzel and Cole Haring each picked up three RBI. The rubber match of the series with Oklahoma is set for Sunday, April 14 at 3 p.m. at Baylor Ballpark.